Last week had been quite a whirlwind… but in the most wonderful way. Last Wednesday 2/15, my hubby and I attended the premiere of Project Eden Vol. 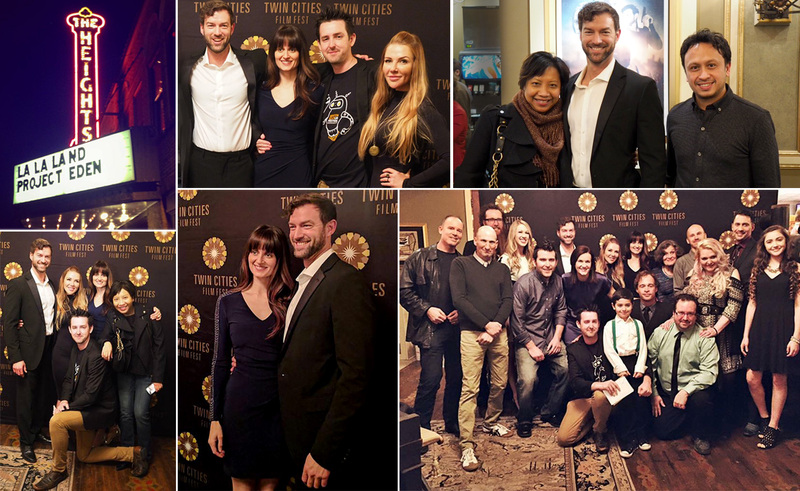 I, part of Twin Cities Film Fest’ Insider Series event, with the cast and crew. It was a fun, festive night. It was lovely to chat a bit with the lovely lead actress Emily Fradenburgh, who arrived early to the event in a gorgeous dress, as I didn’t get to interview her in person. Everyone looked red-carpet ready, including the Twin Cities-based male lead actor Peter Christian Hansen, who was his usual charming self. I had met the duo filmmakers Terrance Young and Ashlee Jensen just hours before for our interview at Nina’s Coffee House. The screening ended with a fun Q&A with the cast and crew. Well, the first part of Project Eden got off to a strong start. The sci-fi thriller deservedly won Best Vision at the Boston Sci-Fi Film Festival just a week prior. It’s an intriguing sci-fi that played more like a conspiracy theory, set in a familiar world like ours, but with a few twists. I have to say the visuals looked amazing, shot by Twin Cities based DP Christopher Lange. It looked more expensive than it was, which is always a feat for indie films. The film’s is quite enigmatic and made you ponder about what’s really going on, but that’s to be expected as we haven’t seen the whole story yet. The two leads Evelyn and Ethan (played by Emily Fradenburgh and Peter Hansen) are definitely the strongest performers of the film. We’re not sure just how their worlds are connected, but we’re given just enough to care about their journey. It’s always interesting when we’re not sure if the protagonist is a good guy or not, and Ethan definitely keeps you guessing. Evelyn and the mystery surrounding her catatonic son is the focal point of the story, and her exchange with Erick Avari’s mysterious character in the third act leads to a massive cliffhanger! I do have a few quibbles, such as the stock characters and their hackneyed dialogue. There are also odd situations that don’t quite add up, which you could refer to as plot holes or continuity problems. But overall, it’s a pretty thrilling set-up that made me eager to see Volume II! I met the duo filmmakers Terrance and Ashlee at another charming St. Paul coffee house called Nina’s. There’s a bit of logistical challenge trying to set up a time to meet, as they were only in town for a few days so no doubt their schedule is jam packed. But it was well worth the effort as they’re one of the nicest people you ever had the privilege to meet! They’re both from Sunshine Coast, Australia, and they certainly had such a sunny outlook on life. By the time I got there, Terrance had stepped out for a bit so I got to chat with Ashlee first. How did the concept/story idea of Project Eden first come about for you? Ashlee: Terrance actually had the concept of the ending, this amazing grand ending, about ten years ago. And we’ve known each other for 11 years, so we talked about it back and forth throughout that time, but of course we ended up doing other things, including 500 Miles (Ashlee’s directorial debut that Terrance produced). Then we went on our separate ways, we did a bit of study and other projects in between. It wasn’t until we stopped here in Minneapolis on our way to Palm Beach for 500 Miles and we walked through the Stone Arch Bridge. And from one side of the bridge to the other we talked out the whole story of Project Eden. Terrance: So the beginning and the end were always there. For some reason, I don’t know if it was a dream or something. So the idea was there but it’s a concept that was going to cost a lot of money so we put it off. I just weren’t at a point in my career yet [to make this]. So Ashlee and I did 500 Miles together in 2014, then a few years later we were here in Minneapolis and we came up with the whole story and started writing it. As we had the beginning and the end, we sort of weaved everything together. Then we decided to do it in two volumes as we know that if we’re trying to do it as one feature we wouldn’t have gotten the budget. It’d be too ambitious. But by doing part I, it opened up a franchise opportunity and we’re able to make Part I with a decent amount of money. So are you saying the birth of the project is right here in Minneapolis? Ashlee: Yes. It’s really interesting because when we had our final filming blocked, so this was a year and a half blocked in three different countries (Australia, New Zealand and the US), the very final scene that we shot was the one that happened at the Stone Arch Bridge. You said you talked through the whole project as you both were walking in Stone Arch Bridge. Did you envision it to be multiple films instead of just one feature? Ashlee: No, at the time, obviously we fell in love with the city, it has the right vibe and we’re like, ‘oh we have to film it here, it’s amazing.’ At the time we were hoping to get it into one story, but by the time it came down to to writing it all out and then of course being indie filmmakers, all the other things came into place. We didn’t have unlimited budget and all these political, behind-the-scenes stuff came up. But we knew in our hearts if we wanted to do justice to the story then we needed to separate it into two volumes. So the first one you’re really setting up the world of Project Eden and getting to know the characters in such a deep level, seeing all their flaws and the journey they’re about to embark on. But we ended it right at the point where things are about to kick off. It’s a massive cliffhanger. You said Terrance had this grand ending idea initially, but did you have the characters in mind at the time? Or is it more about the concept? Ashlee: We didn’t have the name but we knew the central core of the story is a young woman and her son who’s in a catatonic state. In the concept video, both of you said that the world seems to think that spirituality and science are two separate things while you think it’s one and the same. Would you expand a bit on that thought? Ashlee: Sure. Of course these are our personal perspectives how we view reality.. But we see time and time again where there’s always this opposing views that you’re either spiritual or you have this scientific belief. While we’re like, well why can’t it be combined? Because anything that is scientific has a spiritual element and vice versa. The nature of the universe and everything that we’re even sitting in today is so overwhelmingly vast and amazing, I don’t think you can pinpoint it down to just science. There is always this grander allusion of spirituality so we feel that the two are so complexly and deeply intertwined that it’s one and the same. Terrance: I feel like our world today is governed by religion to the point of our detriment. We’re killing each other because of religion. At the end of the day everyone has a spiritual side, but we can still have science without discounting spirituality. That’s what we’re trying to do, with our science fiction [story], we do deal with science but there’s a spiritual element to it ‘cause I think that’s how the world is, physics and spirituality goes together. That’s our belief and people put in what they believe in into their own projects. So did this film start out as a short film? Ashlee: No, it’s a short film that Terrance and I did maybe about four years ago that has the same name. There are a few little themes that are similar to this feature film but it’s really more of a stand-alone story. If we’re ever going to expand on that little short, it’ll be more of a series. So no, this film didn’t originate as a short. How about the financing aspect of this film? Did you go through crowdfunding route or did you talk to a bunch of financiers for this? Terrance: Yeah, for the last film we did the crowdfunding route. It worked all right. But we knew we’d never raise the amount of money needed to make Project Eden. But we knew a guy who wanted to invest in our last film but the timing wasn’t right, so we went to him and he put in a bit of money. We also found a couple other investors so we’re able to put together some money to go and shoot the first half of the movie. Ashlee: Yeah it’s a bit of an unorthodox approach. So we got a small pool of money and we knew it’s a catch 22. We need more money but we wouldn’t get more money until they see what we could do. So we took a massive risk. We came here [to the US] then came home with the first 20 minutes of the film. Terrance: We had some money from investors but it was only like 50 grand here, 50 grand there, so we had about $150K all together to do the initial shoot. It’s totally unusual and a huge risk, because normally you don’t shoot the first 20 minutes in order. Then we presented that to the investors and showed them what it would look like. So we got more financing and went back to shoot the rest of movie in New Zealand and then back to Minnesota. So in which country did you shoot the first 20 minutes? Terrance & Ashlee: Here in Minnesota. Wow, there’s a lot of Minnesota connection. Terrance: Yes, we basically shot half the movie here in MN and half in New Zealand and a little bit in Australia. What made you decide to collaborate and co-direct this film? Ashlee: This one is a huge… the premise of this concept is big, and there’s all these intricacies that work up to the grand ending. So for us, to make sure that we always have one another’s back that no one would fall behind, we’re always on the same page. Since we wrote this together, we decided to direct this together as well. We’ll do the same for volume 2, but this project is the only one we’ll do it like this. Terrance: It was so ambitious that we knew that one of us could not just go and direct this. Ashlee is so great about working with actors and getting the performance out of them. My background is in post production so I’m more on the technical side. So we’ve got two different viewpoints but because we were on the same page when we wrote it, there was never any sort of clashes of creative ideas. Yes, Peter mentioned that it was seamless collaboration that if it wasn’t the case, then you guys did a good job in shielding it from him and the other actors. Terrance: Yes we sort of had this agreement that if they had questions about characters then they’d go to Ashlee. If they had other questions such as the logistical stuff then I can handle those. Of course there were times that we chimed in together, but for the most part I’d handle the business if you will, how we’d get everybody to New Zealand and all that. But yeah we both learned from each other. So how was the experience of collaborating? Do you want to keep doing this, directing together again? Terrance: Look, we’ll definitely would do this together for volume 2 but after that I think we’d go back to directing and producing as we have two different skill set. But I am looking forward to working together again for the next film. Ashlee: It strengthened our relationship as well. I think the reason why we seemed like this united pair because at the end of the day, we’re always like ‘y’know what, we have respect one another, we listen to one another’s perspectives and we have trust in one another. Because we were the leaders, whatever energy between us would filter down, so we have to make sure everything’s good. What has been the most challenging aspect about making this film, apart from the financing? Terrance: Having not gone the film school route and being told about how to do things. There were certain things that I personally learned the hard way. Even though sometimes it’s the best way to learn, it was very stressful and there were times we thought the movie just wouldn’t get done. Because we had invested so much, so much of our personal lives and also financially and professionally. But of course there’s always the belief that we’d never not finish what we’d started, so definitely there has been a ton of great life lessons and next time we’ll know what to do. I mean there will be a new set of problems but hopefully then we’d know more what to do. Any snafus/mishaps during filming that stood out to you? Ashlee: Well, we came over to America and learned about the politics of how films are run here. Then we went over to New Zealand. It’s like it’s same same, but also totally different. So we learned a little thing the hard way. We did have one incident in NZ. I mean it happens but for us, it was the first big things that happened and we’re like, whoa! We were filming in this little place called Waipu, it’s in the middle of nowhere, about 2.5 hours drive [from Auckland] and in order to get there is this long mountain tracks, all gravel road. Then this generator truck pulled to the side of the road to let a car pass and after all the rain and everything the road gave way and the whole truck rolled four times down the side of the mountain. Fortunately the makeup artist who was in the truck only had this cut on his nose and that was it! Terrance: I know, he could’ve died! Ashlee: Yep, 50 meters off the road and he would’ve fallen into a massive canyon and it would’ve been completely different situation. Terrance: Because of that we only had limited power so our unit base like catering and so on could only have limited power just to have the lights on to keep the schedule going. The thing is, we didn’t really have money for contingency days, so if the lights didn’t work for the shoot, we would be a day behind and we wouldn’t have the money to facilitate that. So it was bad, but we were lucky as nobody got killed. But yeah, the generator was gone, we had to have another one brought in from Auckland. So about casting. How did you cast those sci-fi actors like Mike Dohpud, Cliff Simmons, etc as well as the Twin Cities actors like Peter and Emily? Terrance: So Ashlee dealt with the casting of the Minnesota people, and I dealt with the agents of Mike Dohpud, Cliff Simmons, etc. Ashlee: With the hierarchy of films, as we get further in our careers, casting directors would cast a lot of the actors. But I personally love the audition process, love it. Not obviously for the smaller, background extras but the key people, we want to be a part of that. So when it came to the leads, we’ve got this little tradition that we’re always going to continue doing because we believe in supporting emerging creatives. So we always wanted our leads to be up and comers rather than established actors. So when it comes to casting here, we did a round of auditions and then everyone we liked we’ve got call backs and we did a few little read throughs. I think the crux of it, and there were a lot of talents, but there were a set of people that we really liked so we just sat down and had a conversation with them. Because when you worked with in such a small level, the people you work with became your family. So you want to know that they’re good people, that you like them, and they’re true collaborators. Emily and Peter just hands down just stand out, they’re both just all around good people. Terrance: And we saw a lot of people so it’s not like we just picked them because they were presented to us. Like for Emily we must’ve seen about fifteen people and I think Peter too, there were probably similar amount. Ashlee: And people were sending tapes to us too, so there were quite a lot. Terrance: One of our producers, Sallyanne Ryan, she connected us with a photographer named Dennis Alick [spelling?] who’s very connected with the sci-fi channel world. He’s friends with Mike Dohpud. And we actually initially talked with an actor by the name of Robert Knepper, he played the character T-Bag in Prison Break. He’s very well known for that. But then he ended up not being a good fit for us, so we said we wanted to speak to Mike. So I spoke to his agent and did the deal. He said the reason he wanted to do it was because he loved the script. And then, because of that, see I grew up watching Stargate-SG1 and I love Cliff Simon who’d be great for the Russian. Terrance: So we had a chat together, we had Skype sessions, we did hours and hours working on the script. We worked on the dialog, he got really heavily involved. He came to New Zealand and he shot his scenes. So I’d say those three guys (Mike, Cliff and Erick), who I called the Stargate alumni, really brought a whole extra layer, dimension to the cast. So we’ve got these emerging actors from Minnesota surrounded by veteran International cast. Mike is Canadian, Cliff was born in South Africa but now lives in L.A. and Erick is of Indian descent but lives in the US. So this is Volume I. So have you set up a time for Volume II? Terrance: Yes it’s in development. We’re already working on the treatment, we’re already working on the script and we want to head to it straight away. Ashlee: Exactly. Ideally we’d like to shoot this in 12 – 18 months. Is it going to be set in the same location or are you thinking of finding another spot? Terrance: It’s definitely still in North or South America, we’re not going outside of that. And the same cast, too? Terrance: Well, the thing is we don’t want to say yes, because then you spoil the movie as then you know who dies in the first film. We don’t want to give anything away. Yeah I know, but I really want the MN cast to be in this again, they’re such good talents. Ashlee: But let’s just say we would be very happy to work with them again. Terrance: One thing we want to reiterate is that we purposely marketed this as Volume I. Because we felt that if we just call this Project Eden and they saw the movie and only saw half of the story, they might feel cheated. But if they go in knowing that this is Part I and it ends at cliffhanger, they hopefully won’t get mad about it. Ashlee: Hopefully they’d leave feeling excited to see where it’s going. Terrance: I know it is a risky move for an indie film [to do it as two movies] as you just don’t know. But we followed our instincts and ironically it’s sort of having an opposite effect where they want people to buy it to see part II. Terrance: If you add it all together, it’s only about 4-5 weeks of filming. But when we split it up, it took about 10 months if you spread it out. But from concept to the finished product [for Vol.I] it took about 2 years. As far as the number of days, about 24 days. With pick up it’s 24 days. Ashlee: That’s the thing with indie films, we were fitting in 6-8 pages a day, where normally on a bigger set, you have the luxury of only doing 1 page a day. One last question for you Ashlee. I’ve been a champion of female filmmakers for a long time, which I tried to do on my blog. So would you comment a bit about the lack of gender diversity in the industry? Ashlee: It’s an interesting topic for me to talk about because I feel like, perhaps I’m just lucky but I also think it’s about the people you surround yourself with. Terrance and I, we hire people based on their skill set and nothing else. And so honestly, on most film sets that we’ve done we’ve actually got more women than men. And it just happens to turn out that way. I would love to see more women in higher up roles and I think it is slowly happening, there’s a bit more awareness there. In fact there is a film festival recently that just had a gender blind [system] so that when people put in their submissions, there are no names nor gender attached. And within the first year, they went from 3% to 50% of female directors and producers as they base everything purely on merit, on the work themselves. Look I think it’s changing. I mean, Terrance and I, we naturally who we are, we’re pioneering for that [diversity] but we’re not seeking to stand up and put a fuss about it. We are who we are, and I think we stay true to who we are in hiring people based on their abilities then hopefully the perception will start to shift. Terrance: Y’know I actually get angry when people go on and fuss about equality in films because I don’t even think about that. I just think, who’s good for the job, y’know. I mean somehow naturally, a lot of our crew are women. And again, that’s the way it should be. It should be based on the skill set. Ashlee: So yeah, like Terrance said, we don’t want to make a fuss about it but we are going to be role models. Just by being who we are and doing what we do. Terrance: So yeah, we’re not going to force it, we’re going to like count how many women we have in our crew. I think people can’t accuse us about gender discrimination. I think the proof is in the pudding. for the fun, insightful conversation! Project Eden sounds really interesting! I hope I’ll get a chance to watch it at some point. What a fascinating interview too, that story of the truck incident is terrifying! I sure hope so, Allie! I’m hoping they’d get into London Sci-Fi Film Festival and a few others in London. Yeah that truck incident was crazy, thankfully nobody got seriously hurt! Another good interview Ruth, not sure if I’ll watch the movie though. It does look interesting so maybe I’ll give it a watch when it hits Netflix, assuming they can find a distributor. Very insightful about how they split their directing duties, personally I can never co-direct a movie with another director, I’m too much of a control freak. Heck I prefer directing my own scripts. Lol. I think they’ll have VOD distribution by later this year, not sure about Netflix. I think it takes certain personalities to be able to collaborate effectively like they did, and a stellar working relationship too which sounds like Ashlee & Terrance do. Yeah, you have to have some kind of a less ego personality to co-direct a movie, which I assume that’s how the Coen Brothers and other directors who co-directed movies together for a long time. I, on the other hand is more of a it’s my or the highway kind of person, ha ha! I know that many directors working on big projects actually let second unit directors shoot other scenes for them; I don’t think I can even let them to that if say I ever get to work on a $100m film someday. I just think less ego will always lead to stuff getting done and maintain good relationships. I also would rather start small, that’s why I’m doing my short film first and hire a director instead of doing it myself. Learning experience is so valuable, I’ll never pretend I know how to do everything. Now this is what I call a great interview! All the questions were smart and intellectual. The answers by Terrence and Ashlee were so interesting, I literally couldn’t take a break from reading. I loved their take of gender quality and reading about the financial condition was so compelling and now, they have even more respect from me for taking that risk. Also, Erick Avari’s response to the script was so freaking cool! Thanks for taking the time to read it and for the kind words, Shivani! Both filmmakers certainly know their stuff, yet they’re super nice and cordial, it was certainly a pleasant interview! Well, since now I’m embarking on my first short film, I’m even more inspired by indie filmmakers. Well as they say, if your dream don’t scare you, it’s not big enough. Holy cow! What a fine interview. It’s a fascinating journey you are on, my friend. If the project is entered in the London FF, that would be cool. Erick Avari’s face–he’s a face I’ve seen before. A solid addition to the cast. Awww, thank you Cindy! It was really fun chatting w/ the filmmakers. Some of the questions were inspired by my convo w/ Peter, esp the snafu involving the generator truck! Yeah I hope they get in to a ton of film festivals. I’m thrilled for the local actors being in a project that’ll get seen internationally. Erick Avari’s best known for the first Mummy movie. Ah, yes! Keep up the excellent work, Ruth. I am very happy for you. Pingback: Movie Review – Faster, Pussycat! Kill Kill! It’s a low budget movie, but have a very spiritual core. The Actors are good, and the soundtrack very well was chosen.